Allow us to take care of your garage door torsion spring in Oakville, ON. We provide timely, effective, and affordable services in Oakville, Ontario. Our techs are experts in residential spring systems and always equipped to fix any problem with them. Snapped spring? Sagging spring? Noisy spring? Call us. 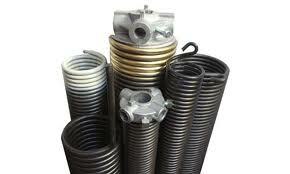 Whether we have to replace or fix the torsion spring at your home, we are here to offer same day service. And you can count on our urgent response for any torsion spring repair because we are aware that garage doors don’t function well or not at all without their springs. When you want urgent garage door torsion spring replacement, count on our quick arrival. If the spring is already broken, the door won’t move. So if you notice that the opener is humming but the door remains on the floor, give us a call. Whether you have torsion or extension springs, we can replace them. Our pros will also replace springs, which are not broken. If they are corroded, too noisy, or close to the end of their lifespan, it’s best to replace them to avoid problems. With early torsion spring replacement, you avoid accidents too. Due to their tension, springs can cause severe injuries or even fatal accidents should they snap at you. That’s why they should be replaced before they snap and never by you. At Oakville Garage Door Repair, we have the equipment we need to replace and repair your springs effectively and in no time. Our pros are insured, bonded, and certified to do any spring job. In order to avoid any trouble related to springs, let us take care of them. Not only will we replace them urgently, but will also offer fast torsion spring adjustment. And that’s because springs must be perfectly tensed in order to open and close the door. Want us to check the door’s balance and adjust the springs? Need to install one more torsion spring? Want to replace your Oakville garage door torsion spring? Call us.